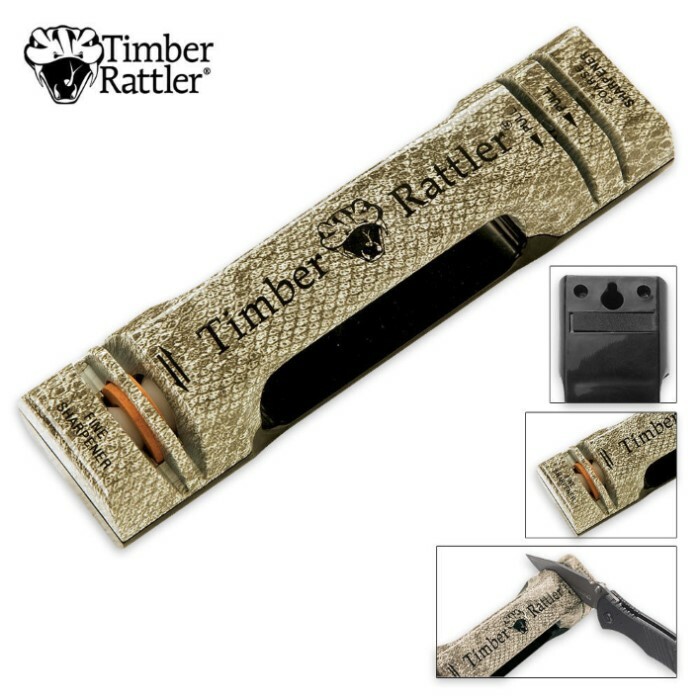 Timber Rattler Deluxe Knife Sharpener | BUDK.com - Knives & Swords At The Lowest Prices! 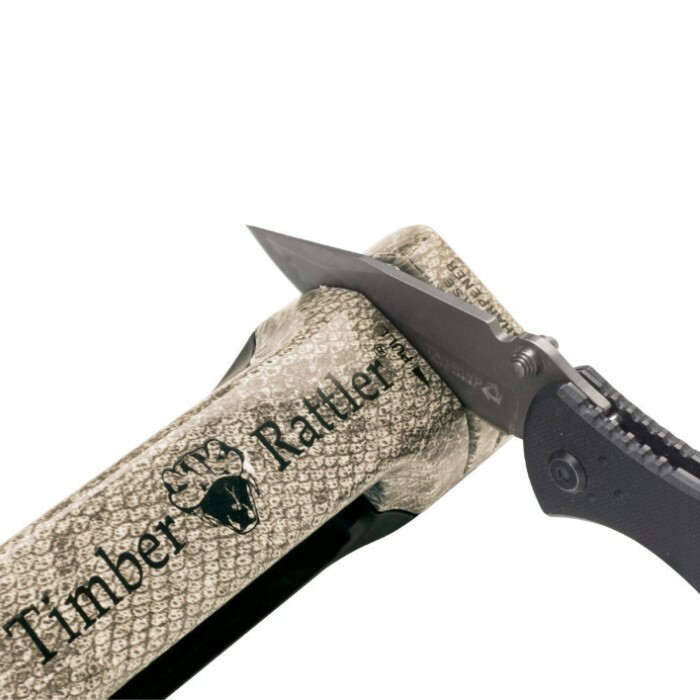 This Timber Rattler pull through knife sharpener is designed to keep a sharp edge on both single and double edged knives. The sharpening wheels are super hardened alloyed metal and ceramic constructed for fine and coarse sharpening. Piece of junk, wont sharpen my knives at all. Guess i just got a dud, sadly. First time i have been disappointed by a BudK item. This was my first knife sharpener that I bought specifically for me. It sharpens blades when you go continually switch left and right on the Fine Sharpener side, but this major problem is that it scratches the blade at the same time. Yes I use my knives for many chores and they can get pretty beat up, but I do not like my knives getting 'injured' while sharpening them. If you do not mind that, then this is a sharpener for you. If you do mind that, then this is the replacement sharpener that I bought from BUDK 'AccuSharp Knife Sharpener Blaze Orange' and it works so well. I've had this sharpener for a few months and it seems to work well. This is the first sharpener I have ever bought and agree that it needed at least some basic instructions. I'm still not sure I'm using it correctly, but it is sharpening some of my knives (but only after I switched sharpening sides). This nice sharpener works pretty well for the amount that it costs. Make sure you look up some review videos of it on youtube to see how to use it if you're having trouble. I would not recommend getting this because a real stone works much better, you have more control over the angle and the edge. This sharpener does the job but it has no instructions other than pull labeled on it which works but quite ineffectively. If you have no desire for a real stone this product would be a decent substitute. I got this knife sharpener today and wasn't exactly sure how it worked so i took one of my knives and ran it through, the sharpener scratched up the entire side of my knife and i did not run it through too hard, it also seems to have done nothing to sharpen my knife. GREAT SHARPENER. GOOD ON LARGE AND SMALL KNIVES. DULL ONES BECAME SHARP IN A MATTER OF MINUTES. its a pretty descent sharpener.. went to town on several of my knives after i figured out how to use it. there was no instruction or paperwork.. and im used to sharpening the old fashioned way. but once i figured it out.. it put a few good edges on. good price.